The Friends of the Parks Inc. Forum concluded today after lunch. 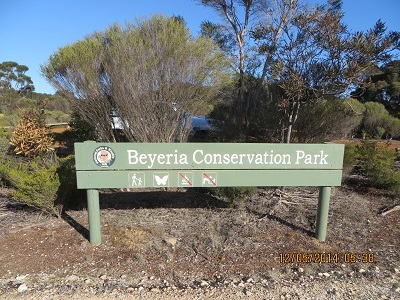 After getting a few supplies in Kingscote we travelled to Beyeria Conservation Park. Beyeria Conservation Park was established to preserve 184 hectares of remnant endemic vegetation on the Eastern end of Kangaroo Island. There is a walking trail of about 1.5 kilometres through the Park with interpretative signs. I set up my station near the Park entrance, thus not walking off track onto newly planted areas. After checking 7.100 I gave a CQ call at 05:57 and was answered by VK5ZAR, Arno. Arno was at home in Adelaide and signals were 5 and 9 both ways. 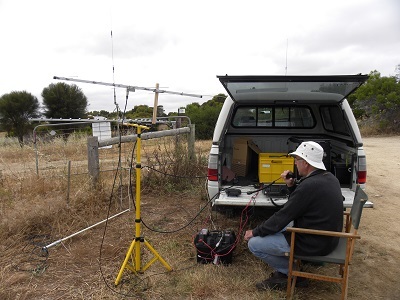 Then followed VK5GW, Graham using his KX3 in Norwood; VK3AMB, Bernard; VK3KLB, Albert at Hastings; VK5ZLT, Alan; VK5KGP, Graham; VK3LY, Bill; VK5LI, Craig; VK3FXUK, Alan at Ararat and, finally, VK5TW, Trevor. The Friends of Parks Inc. is the peak body in South Australia which represents the interests of volunteers in SA Parks, in the wider community and with the SA Government Department responsible for Parks, the Department of the Environment, Water and Natural Resources. The forum is held on an annual basis. My wife and I are Friends of Scott Creek Conservation Park and we were the only members of our Group who attended. Attendees meet all of their own costs. We have been to a number of Forums over the years and have enjoyed the experiences immensely. The program is constructed of lectures with high profile speakers and topics. 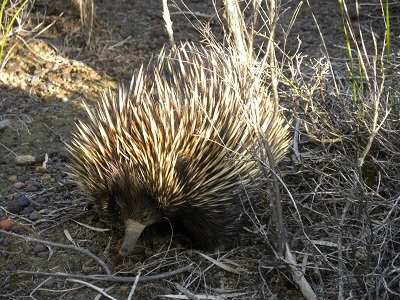 Here are a few highlights: Citizen Science (using community members in the collection of data); the concept of ‘aquapelago’ which emphasises the integration of island and coastal communities, resources, histories and imaginations (such as songs); A study of Echidnas and Goannas on the Island, their behaviours and natural history and field trips to Parks, to name just a few. While I was unable to formally present on amateur radio and parks, I was able to share my enthusiasm for portable operation and the science and art of radio communications with many delegates. Radio is used in the scientific community for tracking animals and some of the participants had knowledge of frequency and propagation characteristics and the behaviour of radio waves in various natural environments, such as animal burrows, for example. Fairy penguins have been fitted with GPS trackers and their sea voyages mapped. Quite a few were interested in what I do and I was ‘caught’ in action at Beyeria CP this afternoon by two delegates. ‘Fox-hunting’ is work for many of these scientists! Kangaroo Island, fortunately, does not have foxes. Radio tracking has been used in the programs to eradicate fallow deer and goats. The ‘Judas’ goat is fitted with a radio transmitter and released and spends its time finding its ‘friends’. This process works most of the time because goats are sociable animals and live in communities. The friends are then dispensed with by shooters. The trouble is that the goats must have reflected on this and they have less and less to do with ‘Judas’ goats. Perhaps they recognise the collared goat? Or perhaps the goats have become more suspicious of outsiders? We were told that there is a small population of six goats remaining and they are proving elusive! This is a very sketchy summary of one of the papers. 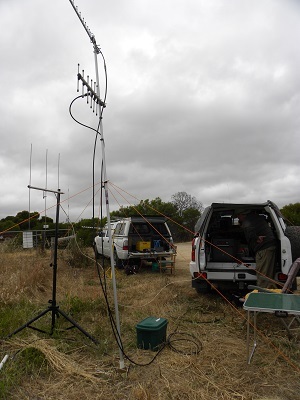 In November 2011, VK5KC, David and I and our spouses travelled to Kangaroo Island for the Spring VHF UHF Field Day. We had a reasonably modest station and here are two pictures from that trip. We established our station (s) near Emu Bay on the Northern coast of Kangaroo Island looking North over Backstairs Passage towards the mainland.